Today and tomorrow people across Czech are voting for who will represent them in the lower house of the Czech parliament. This means today people are picking the two hundred people who will be in government for the next four years. It's been interesting to see the advertisements, posters, and flyers, that have appeared everywhere - along roads and in my letterbox. The last time there were elections I didn't understand any of the words but now I understand more. Although I still have a lot to learn about the government here and the thirty-one parties that run in the elections, and the ten main parties. 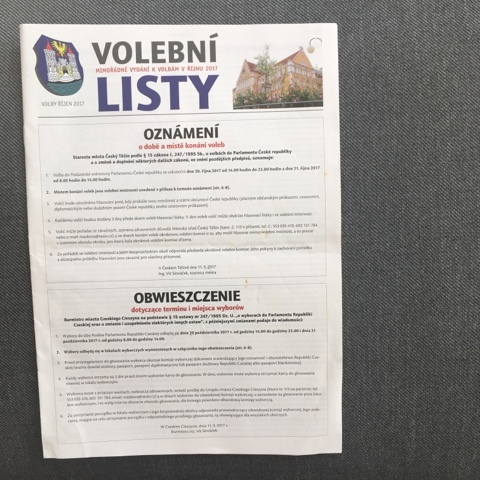 We know that it is ultimately God who is sovereign over all - from the President and Prime Minister, to the people who serve in the government offices in my little border town (where the voting lists, above, are printed in both Czech and Polish). And I'm thankful to live in a country where people can choose who is in power, especially as that has not always been true here. Would you please join me in praying for these elections and their results? That God would powerfully use whoever ends up in power, not for their glory but for His? Czech normally scores higher in corruption scales compared with other European countries, so please pray that all those in government would be people of integrity who will serve the country well. If you're interested the New York Times have an article about the Czech elections that you can read here.